Published by Secret City Publishing Inc. Licensed courtesy of Secret City Records Inc.
Ah, the pain of the teenage years, especially when you're the scourge of your classmates. Coming through the Rye captures those times through such insightful, understanding eyes it seems a bit autobiographical; and sure enough, in the Q&A post screening at the Austin Film Festival, writer/director James Steven Sadwith acknowledged that he was the teenager with a passion for finding Salinger, and this film is based on his experience. 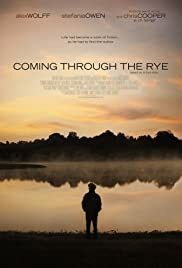 Another interesting revelation during the session was that the film's star, Alex Wolff, related that his grandfather, father, and brother all passed the same copy of J. D. Salinger's Catcher in the Rye onto sons and brother when they were 12-13 years old. The film opens with Jamie (Wolff) having heart-to-heart talks about girls with his older brother Gerry, who has gotten involved in drugs, and is being sent to a treatment center. He thinks he might not go, though, and instead join the armed services (this is the late '60s and the Viet Nam war is ongoing.) Soon after, Jamie is sent to Crampton boarding school and eventually becomes a pariah who is bullied unmercifully. Jamie decides he's had it when he is awakened and attacked in the middle of the night and his room is left in shambles. At that point he decides to run away. Where to? To find J. D. Salinger, his idol. He has so identified with Holden Caulfield in Catcher in the Rye, he has written a screenplay for a theater production. Upon being told that he must get permission from Salinger before it can be performed, and running up against all kinds of obstacles in the mail, he thinks the only way is to talk to Salinger in person. He has no car, so must hitchhike his way to Vermont where he's told Salinger lives. The person who picks him up is actually his "townie" friend, Deedee (Owen), who is a motherly sort and worries about his safety. She gets permission from her parents to drive Jamie up to Vermont just for the weekend, hoping to convince him to return to Crampton after their search. I loved her reasoning when she appeals to her reasonable parents; they end up trusting her and giving her room to use her own judgment. Well, people have been trying for years to find Salinger, who just wants to be left alone. During their search, Jamie and Deedee talk about all kinds of things, and she, who is wise beyond her years, offers comments meant to increase his self-awareness. The film then gets into more coming-of-age dynamics, and ends on valuable moments of truth. Among all the films about/for teenagers, Sadwith's production is one of the most thoughtful and edifying. Problems are cogently presented, and the model of Deedee's friendship and support of Jamie is exemplary in tone and execution. The scenes of young love are touching and funny, beautiful and awkward. Above all, the script is sound in its cause/consequences connections. Eric Hurt's cinematography, especially the sequences outdoors, takes you right into the action and gives you the feeling of being in the film. Similarly the music by Greg LaFollette, Heath McNease, and Jay Nash enhances the story, with the lyrics elaborating on the action. The actors cast for Coming through the Rye seems tailor made for the film. Alex Wolff epitomizes the cautious, brainy kind of kid who doesn't quite grasp why anyone would be against him, although he is sincere and thoughtful. It takes another kind-hearted person to gently bring him to acknowledge his weaknesses and deal openly with a major trauma. Stephania Owen is peppy as Deedee and portrays so well the girl/woman who can be such a valuable friend, but may not be the object of passion. Finally, Chris Cooper, the accomplished actor who has not always received the recognition he deserves, is ideal in the role of Salinger, in his identification with a famous person who does not strive for the limelight. He can be gruff and dismissive, but is clearly attentive to what he sees and hears, and can shift his position in response to a logical or appealing plea—much like the character he plays in August: Osage County as patient and kind, but whose support has limits. Above the norm for movies about teens.